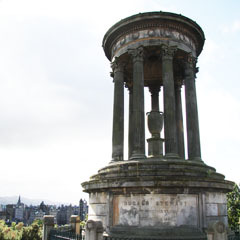 This striking monument, based on a circular Greek Temple, commemorates one of the last important figures of the Scottish Enlightenment, the philosopher and professor of moral philosophy at the University of Edinburgh, Dugald Stewart. 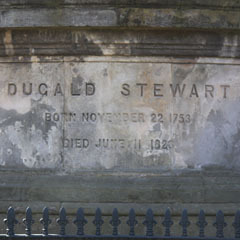 It was completed in 1831, three years after Stewart’s death. He was a disciple of the Scottish Common Sense school of philosophy founded by Thomas Reid, whose lectures at the University of Glagow he had attended. Well known students of Stewart included Lord Palmerston, the future prime minister, James Mill, the philosopher, and Sir Walter Scott, the novelist and poet. 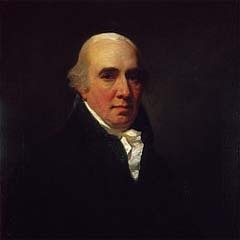 Portrait of Dugald Stewart (1753–1828) by Henry Raeburn. Inscription on the memorial to Dugald Stewart.